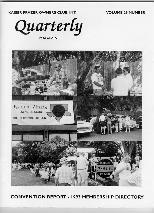 The Quarterly is a professionally printed magazine featuring articles of lasting interest. It includes original factory material, restoration tips and personal K-F stories from members, reports on Regional, Divisional, and National activities, and other items of interest to owners of Kaiser, Frazer, Henry J, Darrin, Allstate, and Willys vehicles. The first issue each year contains a full report of the National Convention including photographs of prize winning cars. This issue also contains a Membership Directory listing members alphabetically and by geographic location. Ben Walker was the Editor of the Quarterly from 1985 until July 2001. The position is now temporarily vacant. The fourth issue each year is a Calendar for the coming year. Mike and Karen Barker are the Calendar Editors.